The Graphic Design Invoice Template allows designers to charge for their services in an organized and time-efficient way. Simply enter the contact information of both you and the client, list out the services completed for the customer, add up the total amounts, and state how long the client has to pay the invoice and you’ll be one step away from collecting your payment. What services can be included? To complete the Graphic Design Invoice in both PDF and Word, check out our how-to below. Step 1 – Download the invoice in Adobe PDF or Microsoft Word. Start off by entering the name of your company at the top of the document. If you are freelancing, either enter the name of the freelancer or leave the field blank. Proceed by entering your Address, Phone, Email, Website name, and Fax, into the area directly below the main header. Step 2 – Similar to above, enter your client’s Contact Information in the ‘Bill To’ section. Step 3 – Next, enter the services that have been completed for the client. Start with a brief Description of the work done, then enter the number of Hours for each service followed by the Hourly Rate. In the PDF version, the ‘Amount’ column will populate on its own. However, if using the Word Version, all amounts will need to be calculated by hand; this is done by multiplying the Hourly Rate by the Hours worked for each service. Step 4 – Enter the TOTAL invoice amount by adding the Sales Tax for your state to the Total Labor. Add any comments or instructions for the client in the footer-area box followed by the number of days until the invoice is due. The Invoice is now ready to be sent to the client. Step 3 – For the Bill To section, enter the Invoice Number assigned to the job, the Name of the client, the Date the invoice will be issued, the client’s Phone Number, and the Address of the client. Step 4 – In the table, enter a Description of the service done, the amount of time allocated to each service (Hours), and the rate charged for the respective service ($ / Hour). 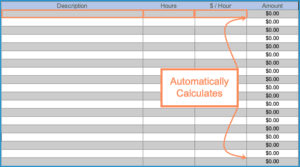 The values of the Amount column and Total Labor cell will automatically calculate. Step 5 – Enter the Sales Tax (in decimal format). The TOTAL cell will now display. Enter any Comments for the client followed by the Days until the invoice is required to be paid. The invoice is now complete and ready to be sent digitally or printed and mailed to the customer.